Reading and share top 11 famous quotes and sayings about Zoologist by famous authors and people. 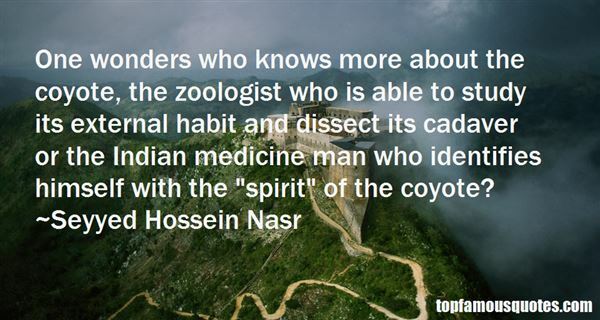 Browse top 11 famous quotes and sayings about Zoologist by most favorite authors. 1. "The zoologist is delighted by the differences between animals, whereas the physiologist would like all animals to work in fundamentally the same way." 3. 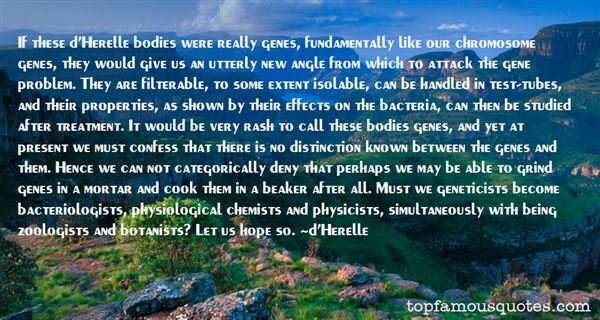 "If these d'Herelle bodies were really genes, fundamentally like our chromosome genes, they would give us an utterly new angle from which to attack the gene problem. They are filterable, to some extent isolable, can be handled in test-tubes, and their properties, as shown by their effects on the bacteria, can then be studied after treatment. It would be very rash to call these bodies genes, and yet at present we must confess that there is no distinction known between the genes and them. Hence we can not categorically deny that perhaps we may be able to grind genes in a mortar and cook them in a beaker after all. Must we geneticists become bacteriologists, physiological chemists and physicists, simultaneously with being zoologists and botanists? Let us hope so." 4. "A zoologist who observed gorillas in their native habitat was amazed by the uniformity of their life and their vast idleness. Hours and hours without doing anything. Was boredom unknown to them? This is indeed a question raised by a human, a busy ape. Far from fleeing monotony, animals crave it, and what they most dread is to see it end. For it ends, only to be replaced by fear, the cause of all activity. Inaction is divine; yet it is against inaction that man has rebelled. Man alone, in nature, is incapable of enduring monotony, man alone wants something to happen at all costs—something, anything.... Thereby he shows himself unworthy of his ancestor: the need for novelty is the characteristic of an alienated gorilla." 5. "But, you say, there is very little conversation in this book. Why isn't there more dialoge? What we want in a book by this citizen is people talking; that is all he knows how to do and now he doesn't do it. The fellow is no philosopher, no savant, an incompetent zoologist, he drinks too much and cannot punctuate readily and now he has stopped writing dialogue. Some one ought to put a stop to him. He is bull crazy." 6. "A race is what zoologists term a variety or subdivision of a species." 7. 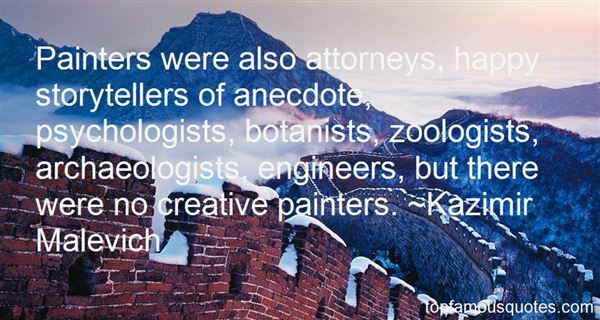 "Painters were also attorneys, happy storytellers of anecdote, psychologists, botanists, zoologists, archaeologists, engineers, but there were no creative painters." 8. "Wildlife conservation is always a race against time. As zoologists and botanists explore new areas, scrabbling to record the mere existence of species before they become extinct, it's like someone hurrying through a burning library desperately trying to jot down some of the tittles of books that will now never be read." 9. "I thought I would be an organic chemist. I went off to university, and when I couldn't understand the chemistry lectures I decided that I would be a zoologist, because zoologists seemed like life-loving people." 10. "One wonders who knows more about the coyote, the zoologist who is able to study its external habit and dissect its cadaver or the Indian medicine man who identifies himself with the "spirit" of the coyote?" 11. "An adult female orang-utan cannot defeat an adult male spotted hyena. That is the plain empirical truth. Let it become known among zoologists. Had Orange Juice been a male, had she loomed as large on the scales as she did in my heart, it might have been another matter. But portly and overfed though she was from living in the comfort of a zoo, even so she tipped the scales at barely 110 pounds. Female orang-utans are half the size of males. But it is not simply a question of weight and brute strength. Orange Juice was far from defenseless. What it comes down to is attitude and knowledge. What does a fruit eater know about killing? Where would it learn where to bite, how hard, for how long? An orang-utan may be taller, may have very strong and agile arms and long canines, but if it does not know how to use these as weapons, they are of little use. The hyena, with only its jaws, will overcome the ape because it knows what it wants and how to get it." Abraham Lincoln was asked by an aide about the church service he had attended. Lincoln responded that the minister was inspired, interesting, well-prepared, eloquent and the topic relevant. The aide said, "Then it was a good service? "Lincoln responded, "No." The aide protested,"But, Mr. President, you said that the minister was inspired, interesting, well-prepared, eloquent, and that the topic was relevant. ""Yes," replied Lincoln, "but he didn't challenge us to do any great thing."